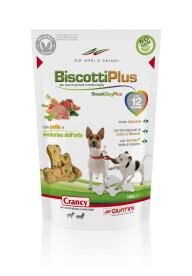 Polpettone Crancy is a complete food suitable for adult dogs of all breeds. Il Polpettone Crancy can be served on its own or mixed rice, pasta or other starchy food, or used as a reward for your dog. Serve at room temperature. Remember to always leave a bowl of fresh water available for your dog. For dogs that are fed exclusively on “Il Polpettone”, it is advisable to periodically shift the diet to dry food. Calculate the recommended daily intake for your dog, it is fast and easy. to be divided at least into two meals. Crancy Il Polpettone at will! * The result is calculated on the basis of equations from the international literature and, therefore, subject to changes and feedback from the user. The results obtained are purely indicative and under no circumstances should replace the advice of a veterinarian. Crancy Polpettone Chicken and Beef Composition: Meat and animal derivatives 65% (Beef min. 5%, Chicken min. 5%), Cereals, Derivatives of vegetable origin, Minerals. Crancy Polpettone Chicken and Turkey Composition: Meat and animal derivatives 65% (Turkey min. 5%, Chicken min. 5%), Cereals, Derivatives of vegetable origin, Minerals. Moisture 68%, Crude protein: 13%, Crude oils and fats: 9%, Crude ash: 9%, Crude fibres: 2%. Vitamin A: 2500 UI/Kg, Vitamin E: 15 mg/kg, E4 Copper: 2 mg/kg, E5 Manganese: 2,5 mg/kg, 3B201 Iodine: 0,3 mg/kg, E8 Selenium: 0,09 mg/kg. 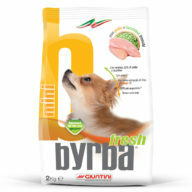 From Byrba experience was born Byrba Fresh Mini: the evolution of an historic Giuntini’s product for small breed dogs. All dogs need to chew dry biscuits to help them have strong, healthy teeth.